Donald Trump has revealed he directed White House press secretary Sarah Huckabee Sanders to stop holding regular briefings, claiming she was treated too unfairly by the media. "The reason Sarah Sanders does not go to the 'podium' much anymore is that the press covers her so rudely & inaccurately, in particular certain members of the press," the President tweeted. "I told her not to bother, the word gets out anyway!" The reason Sarah Sanders does not go to the “podium” much anymore is that the press covers her so rudely & inaccurately, in particular certain members of the press. I told her not to bother, the word gets out anyway! Most will never cover us fairly & hence, the term, Fake News! The White House has faced criticism from media organisations over its lack of regular press briefings. Ms Sanders is yet to hold a formal press briefing this year, with the last one taking place on December 18. Mr Trump's tweet came shortly after White House spokesman Hogan Gidley's appearance on Fox News, in which he was asked why briefings had gradually tapered off last year. "It's not that they've ever stopped; it's just that sometimes we need to come to the podium to communicate things and sometimes we don't," he said. "A lot of the times when we don't come to the podium it's because the President has addressed the American people himself," he said, adding that Ms Sanders would return to the podium "when she finds a reason to do that". "It's kind of ridiculous. You can't win for losing half the time," he said. "But the fact is, when the President isn't going up we have a conversation about the message we deliver, and Sarah Sanders will absolutely be back at the podium talking to the press and delivering the message to the American people." This marks the longest time since a briefing has taken place. Last year, Ms Sanders held two briefings in October and just one each in November and December. In the most recent conference, Ms Sanders was quizzed over Mr Trump's claim that the new trade deal would pay for the wall. A reporter asked where the additional funding for the wall would come from, to which Ms Sanders responded: "The President has been clear that the USMCA deal would provide additional revenue through that deal that would show that Mexico was paying for the wall." "Not to the Treasury, though. The trade benefits, if there are any, don't go to the Treasury," the reporter challenged. "He's saying that the revenue provided and the money that would be saved through the USMCA deal, we could pay for the wall four times over. And by doing that new trade deal, we have the opportunity to pay for the wall," Ms Sanders replied. "But trade benefits go to private citizens. They don't go the United States Treasury," the reporter pointed out. Ms Sanders said the President was referring to the overall revenue that would be raised from the deal. But when asked if that meant the administration was going to tax, she said no. "No, we're not taxing. We're talking about additional revenue that wouldn't have existed without the President getting a new deal." After the conference, Breakfast Media's Andrew Feinberg shouted "Do your job, Sarah!" at the Press Secretary. Sarah Huckabee Sanders refuses to do the job for which she is paid money raised from US taxpayers. She delays each briefing so she can use a presidential event as an excuse to end it early. She does not respond to emails, she does not meet with (most) reporters. Why is she here? But not everyone is against Ms Sanders. Speaking on Fox News after the Feinberg incident, NewsBusters managing editor Curtis Houck said she can't make press reporters happy. "If she holds regular briefings, they'll devolve into chaos with folks like (CNN reporters) Jim Acosta and April Ryan playing for the cameras. If she doesn't, there's complaints about a lack of press access to the executive branch," Houck said. "This is yet another example of how the DC press want to have their cake and eat it too." This is far from Ms Sanders' first time in the headlines. Back in August, she made headlines after firing up at CNN's Acosta during a briefing. It happened after he asked the Press Secretary to say whether the press is indeed the "enemy of the people", as her boss has controversially claimed. "I think it would be a good thing if you were to say right here, at this briefing, that the press … are not the enemy of the people. I think we deserve that," he said. "It's ironic, Jim, that not only you and the media attack the president for his rhetoric when they frequently lower the level of conversation in this country. 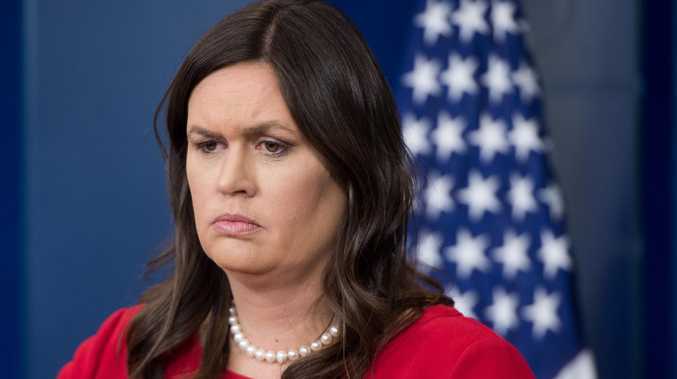 Repeatedly, repeatedly the media resorts to personal attacks without any content other than to incite anger," Ms Sanders fired back, claiming the media has attacked her personally "o a number of occasions". "Including your own network said I should be harassed as a life sentence. That I should be choked. ICE officials are not welcomed in their place of worship," Ms Sanders said. 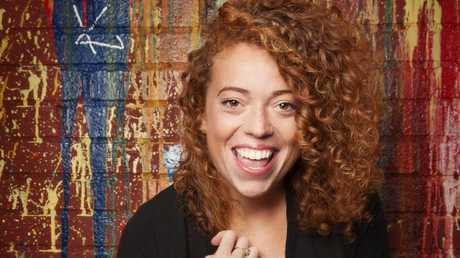 Michelle Wolf was slammed over her roasting of Sarah Huckabee Sanders at last year’s White House Correspondents’ Dinner. at a prestigious media dinner in Washington, which targeted Ms Sanders while standing just metres away from her during the 2018 White House Correspondents' Dinner. During the 85-second roast, Ms Sanders was repeatedly branded a liar and was likened to Aunt Lydia from The Handmaid's Tale - a character who indoctrinates women with the beliefs of the new society and forces them to accept their fates. "And of course we have Sarah Huckabee Sanders. We are graced with her presence. I love you as Aunt Lydia in The Handmaid's Tale - Mike Pence if you haven't seen it you'd love it," Wolf began. "Every time Sarah steps up to the podium I get excited because I'm not sure what we're going to get, a press briefing, a bunch of lies or divided into softball teams. It's shirts and skin and this time don't be such a little b**ch Jim Acosta. "I really, really like Sarah. I think she's very resourceful. Like, she burns facts and then she uses that ash to create a perfect smoky eye. Like, maybe she's born with it, maybe it's lies. It's probably lies." She also labelled Ms Sanders an "Uncle Tom" - a derogatory term for a subservient person based on the character from the novel Uncle Tom's Cabin, and likened her to conservative political commentator Ann Coulter. Mr Trump later described Wolf as a "filthy 'comedian'" who "totally bombed". A number of high-profile US media figures, including The New York Times' White House correspondent Maggie Haberman, TV news presenter Mika Brzezinski and former press secretary Sean Spicer were also among those who slammed the controversial speech.